It is time to plan for next week! Are you going to get all your important stuff done next week? I know specific areas that need attention to increase satisfaction - Step 1. I know my priorities - Step 2. I know what core habits I want to cultivate - Step 3. These are all consistent with 1, 2, and 3 above. Other potential items did not make the list such as mountain biking in southern Indiana and others' open houses. So, now I am ready to plug them into my calendar. I know I am a morning person. 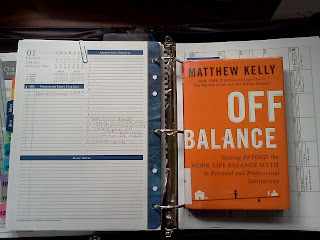 Accordingly, I will do well to plan to do the heavy duty stuff first thing, instead of piddling around checking e-mails. Friday, June 1, 6:30pm - host small group. Preparation already done. Saturday, June 2 - morning coffee with Darling Bride. Mulch after breakfast. Sunday, June 3 - Church on Sunday! Confirm youth choir rehearsal for youngest son (4pm). Write blog post about educational value of mulching to post at Do It Yourself High School blog. Monday, June 4, office - Clients' compilations first thing BEFORE non-essential e-mails and self study training. Monday evening, home - outdoors activity, help Ryan with domain name issues. Wednesday evening - Ryan and Grace to youth group, 1st meeting of summer (I forgot about this one until I proofread this post!). Good time to work on next series of blog posts. Lunch hours - work on blog posts, read others' blogs. Typically, only 7 days would be planned out, but this week I'm getting a head start. The final step is Quarterly Review, just like performance reviews at work, except I review myself. 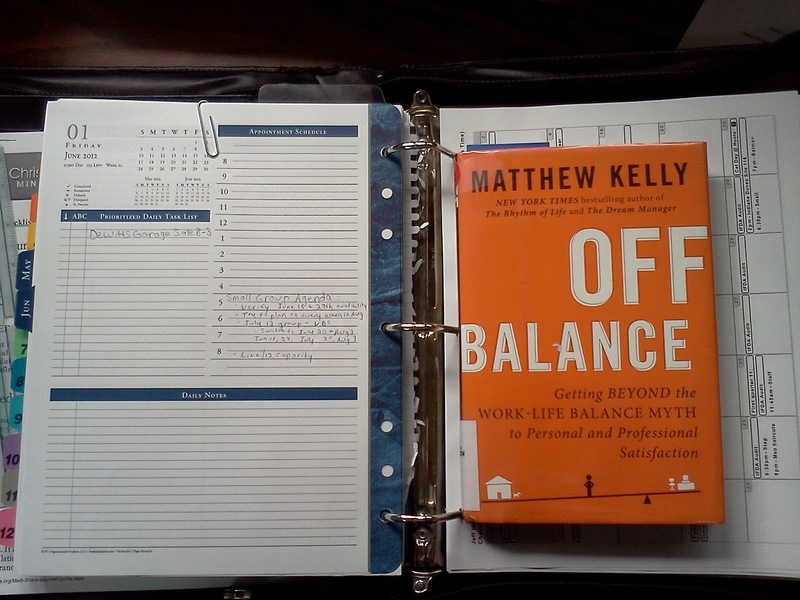 Matthew Kelly emphasizes accountability (he says on page 135, "Accountability brings out the best in me.") And I agree. It is one thing to make a promise to myself. I am very forgiving of my shortcomings. Another thing to be accountable on a blog. Google Analytics and Feed Burner tell me you are out there, whoever you are. Thank you! Still another to have coffee with Darling Bride in a few months, around Labor Day weekend, and show her. But you read it here first, it is on my calendar for discussion during a quite time over the long weekend! Conclusion: I am glad I found this book at the library. Its primary strength is that it is a short book with specific steps to implement. As previously written, I am not affiliated with or being compensated in any way for writing about this book. This is all on my own initiative.